Imagine finding the countertop of your dreams. It may be a luxurious white marble like Calacatta Borghini or a colorful granite like Van Gogh. You couldn’t be happier. Then the production manager says that your countertop is going to need a seam. Don't fret, and here's why: an experienced distributor and fabricator of natural stone materials will know how to work with seams to ensure not just a perfect fit but look as well. Honestly, no one likes seams in their countertop. Simply mentioning it is enough to cause some to cringe. Unfortunately, it’s not always possible to do an installation without making one or several seams. This is because the size of your chosen stone and the shape of your cabinets may force a seam into your dream kitchen plans. But a seam does not have to be a design disaster. And it won't be, so long as the countertop company or stone supplier that you use is experienced and willing to put in the effort to create proper seams. Otherwise, you’ll be stuck with a kitchen or bathroom countertop with a very distracting focal point. Only with the right planning and procedures will seams be as transparent as they can be. Can you imagine anything worse than finding that slab of Astoria granite you’ve been searching high and low for and then during the installation the veins don’t line up at the seam? You would be devastated, and rightfully so. The reality is, most countertop installs will require some kind of seam. What proper placement of that seam comes down to is essentially experience. A stone provider and fabricator with decades in business will likely understand that the best seams are the ones that aren't commonly seen. A good example of good seam work would be the fabricator who only uses mitered edges for corners, as it makes them look nearly seamless. Knowing the difference in application and use is a major advantage for a stone provider, as it makes all the difference between an ok job and a great one. We have an expert staff that pays close attention to detail when planning and installing your counters, knowing where and how to add seams without hurting the overall aesthetic of the final install. Aside from being professionals with decades of experience, we're also the largest provider of natural stones in the world. Our stock consists of over 300,000 slabs. Because of this, we have a clear advantage when it comes to dealing with seams during installations. Other countertop companies, due to their limited supply, are forced to fit a large countertop onto the same slab. This creates a huge problem for matching up the areas of the stone for seams, especially with a veiny stone like Classic White Quartzite. If you have to design your counters by using only one slab you run the risk of not properly aligning the veins or color. This can easily happen because every natural stone is completely unique. Each slab is cut out of a different section of the mountain at the quarry. So one piece of Mountain White Danby will be completely different from another piece that’s cut only centimeters away. Furthermore, even the same slab can have two drastically different looking areas. Without the luxury of finding another slab that will line up at the seam, you can wind up with a real eyesore. Luckily, our massive selection (from Ridgefield Park to East Stroudsberg) allows you use multiple slabs to get the best match possible. Many countertop companies place their seam in an area that is convenient for them, not you. 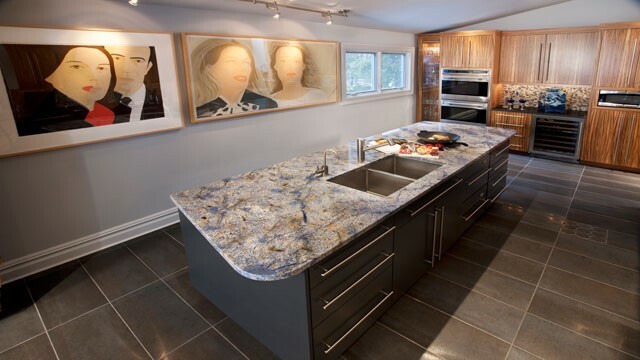 Due our experience and background, we place seams in the most discreet areas possible to keep your countertops looking as good as possible and to ensure you get exactly what you paid for.